The Blazer Safety Maze was held March 7, allowing students from all over campus to come. The safety maze's goal was to teach students about the dangers of driving under the influence. 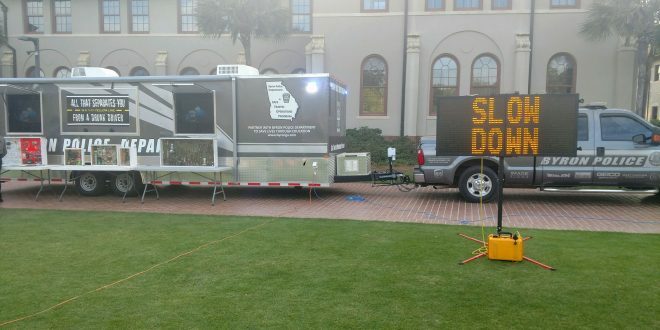 On March 7, VSU Police hosted the Blazer Safety Maze, an event where students can see the effects of intoxicated driving. The Blazer Safety Maze took place on the VSU front lawn and was coordinated by Sgt. Heidi Browning. “We want to educate students and remind them of the dangers of driving intoxicated before spring break,” Browning said. 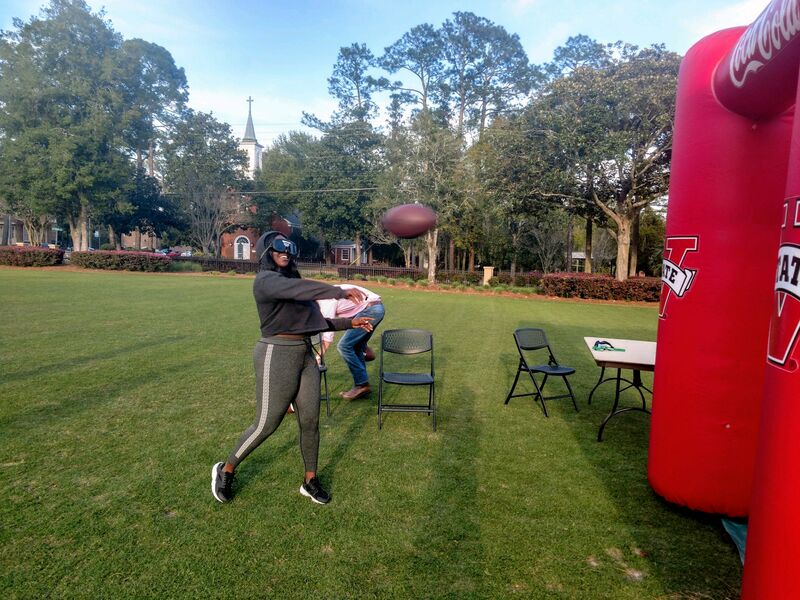 Officers at the exhibit gave students drunk goggles to wear for each event, which included a driving simulator, throwing a football at an inflatable target and playing corn-hole. There were different pairs of goggles for different levels of intoxication. Faith McFadden, a freshman biology major, said the goggles she wore were for someone with a blood-alcohol-content (BAC) of .07 to .10 which is just above the legal driving limit. 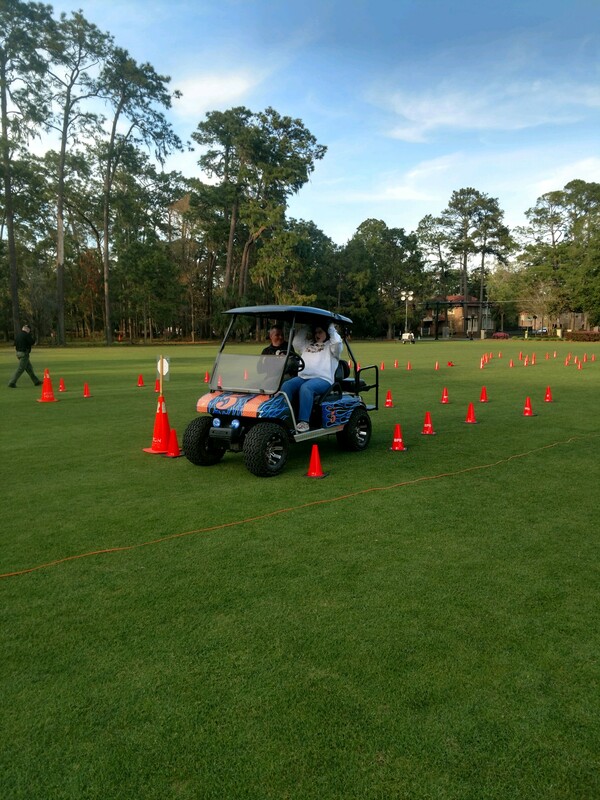 The simulator featured traffic cones arranged like a maze on the front lawn and a golf cart that the students drove while wearing the drunk goggles. A police officer rode with the students while they went through the maze of cones. The Blazer Safety Maze also allowed students to simulate what it’s like to be in an accident. The accident simulator had students buckle up into a car seat only to get dropped at about 10 mph. This let them feel the impact of what an accident at that speed would feel like. According to responsibility.org, alcohol-impaired driving fatalities accounted for 28 percent of total vehicle traffic fatalities in 2016. Also, in that same year, The National Highway Traffic Safety Administration stated that out of 37,461 deaths from traffic crashes in the U.S., 10,497 of those deaths were from drunk driving accidents. Over 18,000 people were arrested for driving under the influence in the state of Georgia alone. Lt. Bryan Hunter of the Byron Police Department said his precinct travel across the state to do as much education on driving under the influence as possible. “We do this to prevent people from dying on the roads,” Hunter said. 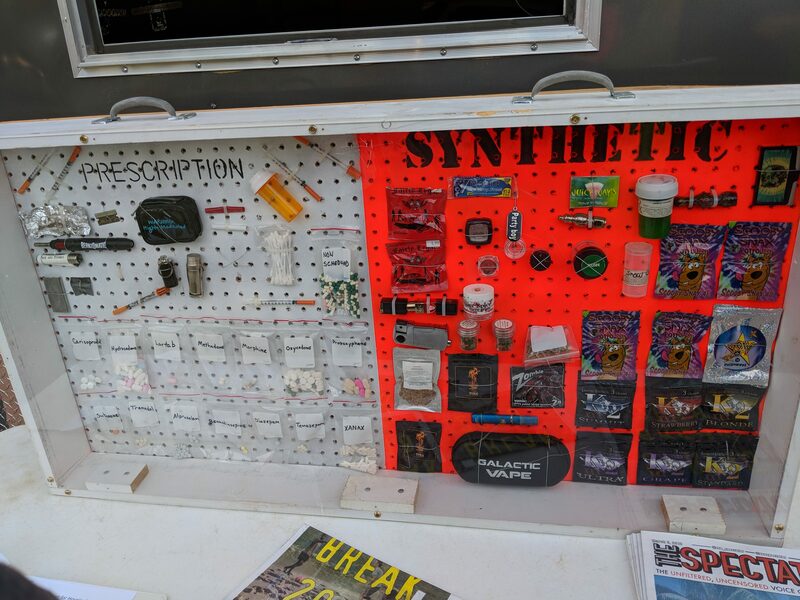 In addition to having the drunk-driving simulator, the Byron Police Department has a trailer that displays an array of drugs and paraphernalia seized by the Byron County Police. “Driving under the influence of drugs (DUID) is becoming more popular than a DUI,” Hunter said. Students were also encouraged to utilize services such as Uber, Lyft and local taxi companies after they have consumed alcohol or other impairing substances. In addition to these options, the Blazer Safe Ride, a service provided by Parking and Transportation and UPD, is provided daily from 11 p.m. to 3 a.m. to give students a safe mode of transportation at night to all parts of campus. Written Veronica You, Special Projects Manager. Photos by Hunter Terrell, Social Media Editor, and Veronica You.